On August 19, National Soft Ice Cream Day is celebrated throughout the United States. This food holiday celebrates a type of ice cream that has been around since 1930s. Soft ice cream is typically referred to as soft serve ice cream or simply soft serve. It is softer than regular ice cream due to air being incorporated during freezing. Introduction of air helps create smooth and light texture. Soft serve is believed to have been created due to an accident. In 1934, Tom Carvel, the founder of eponymous ice cream brand and franchise, had to sell melting ice cream on a parking lot because his ice cream truck had a flat tire. He noticed that people were delighted with soft frozen dessert and concluded that it was a potentially good business idea. Dairy Queen also claims to have invented soft ice cream. 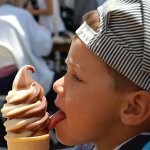 Soft serve became popular in 1960s, when mechanized air pumps were introduced into vending machines, allowing to double the amount of air in ice cream. The more air soft serve contains, the smoother, creamier, and lighter its texture is. To celebrate National Soft Ice Cream day, indulge yourself with a cone of soft serve. It comes in many different flavors, so you will definitely be able to find a flavor to your liking. Enjoy!